New high-resolution images captured using the ESO's Very Large Telescope revealed infrared radiation leaking through Jupiter's cloud tops. With NASA's Juno probe getting ready to enter into close orbit around Jupiter on July 4, the Very Large Telescope in Chile has captured stunning new infrared images of the gas giant. 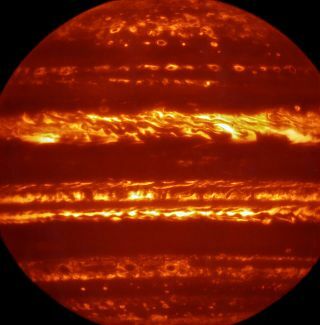 Using the Very Large Telescope Imager and Spectrometer for mid-Infrared (VISIR) instrument, the ground-based images revealed, in fine detail, infrared radiation leaking through Jupiter's cloud tops, causing the planet to look as though it were made of flame. The new images were part of a larger campaign to create high-resolution maps of Jupiter's complex atmosphere, which has involved the use of several telescopes based in Hawaii and Chile, as well as contributions from amateur astronomers around the world. Efforts to create high-resolution maps of Jupiter's complex atmosphere involved the use of several telescopes based in Hawaii and Chile, as well as contributions from amateur astronomers around the world. "Together with the new results from Juno, the VISIR dataset in particular will allow researchers to characterize Jupiter's global thermal structure, cloud cover and distribution of gaseous species," Glenn Orton, the lead scientist in charge of the ground-based campaign in support of the Juno mission, said in the statement. On July 4, the Juno probe will arrive at Jupiter, and get closer to the gas giant planet than any other probe in history. Launched in 2011, the primary goal of the Juno mission is to collect information regarding the planet's interior, which, in turn, could provide insight into how the solar system formed. "These [new infrared] maps will help set the scene for what Juno will witness in the coming months," Leigh Fletcher, of the University of Leicester, said in a statement. "Observations at different wavelengths across the infrared spectrum allow us to piece together a three-dimensional picture of how energy and material are transported upwards through the atmosphere." A team, led by Fletcher, will present the latest images at the Royal Astronomical Society's National Astronomy Meeting in Nottingham, U.K.